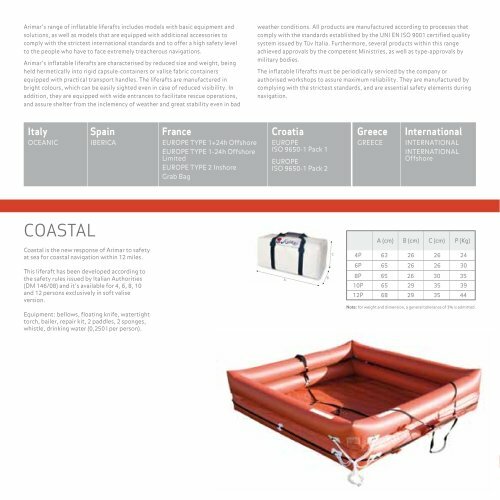 Arimar's range of inflatable Mferafts includes models with basic equipment and solutions, as well as models that are equipped with additional accessories to comply with the strictest international standards and to offer a high safety leve to the people who have to face extremely treacherous navigations. Arimar's inflatable life rafts are characterised by reduced size and weight, being held hermetically into rigid capsule-containers or valise fabric containers equipped with practical transport handles. The liferafts are manufactured in bright colours, which can be easily sighted even in case of reduced visibility. In addition, they are equipped with wide entrances to facilitate rescue operations, and assure shelter from the inclemency of weather and great stability even in bad weather conditions. All products are manufactured according to processes that comply with the standards established by the UNI EN ISO 9001 certified quality system issued byTuv Italia. Furthermore, several products within this range achieved approvals bythe competent Ministries, as well as type-approvals by military bodies. The liferaft-21106.html">inflatable liferafts must be periodically serviced by the company or authorised workshops to assure maximum reliability. They are manufactured by complying with the strictest standards, and are essential safety elements during Coastal is the new response of Arimarto safety at sea for coastal navigation within 12 miles. This liferaft has been developed according to the safety rules issued by Italian Authorities and 12 persons exclusively in soft valise Equipment: bellows, floating knife, watertight torch, bailer, repair kit, 2 paddles, 2 sponges, whistle, drinking water (0,250 I per person). Note: for weight and dimensions general tol lera nee of 3% is admitted.